Not everything in your home has to break the bank…but sometimes you have to go big or go home. Do you ever find yourself wondering, is it REALLY worth it to spend this much money on something for my home? It’s a question we’ve all struggled with (some more than others, I would guess). I think we’ve all been in the scenario, though, where we tried to save a little money and ended up regretting it. “Ugh, why didn’t I just spend a little more and buy a chair that will last me YEARS? !” I’ve done a little thinking and compiled a list of the items that I think are the most splurge-worthy items for your home, the items you’ll never regretting spending a little extra money on. Trust me, you’ll thank me you did it! A Custom Bed. Your bedroom should be your sanctuary and the focal point should be your bed. 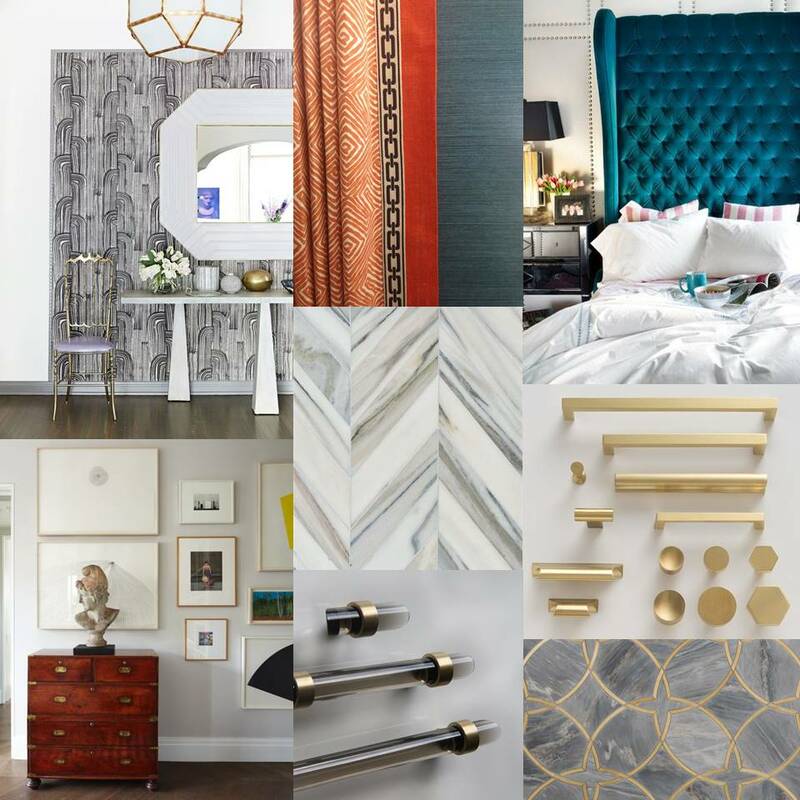 Whether you want a simple headboard in a dramatic patterned fabric, or a huge tufted headboard in a luxurious solid, it’s worth shelling out some cash to get the perfect piece. You can definitely find nice headboards that you can just order, but there’s something amazingly fun about dreaming up a custom furniture piece for the place you rest your head every night. It’s the only way to get the perfect headboard silhouette in the perfect fabric so I dub this item infinitely splurge-worthy. Brass-Accented Furniture. Hardware can make or break the look of a piece of furniture. Dramatic hardware will always up the price a little bit, but it’s entirely worth it. If you find a piece of furniture that you love but it’s lacking in the “hardware style” department, spend a little more on some better hardware. My current favorites are anything brass, acrylic, leather, or horn. Statement Wallpaper. I feel like I’ve said this before, but I’m happy to say it again: I love wallpaper. Designers always say that the easiest thing you can do to transform a room is to paint, but I like to take that a step further and say that the most dramatic change you can make in a room is to put up some beautiful wallpaper. I put this in a splurge category, but it honestly doesn’t have to be. Are there wallpaper options out there that would cost you $250 for a single roll? Yes, of course, and they’re amazing. But, you can also find wallpaper that is significantly less expensive. Either way, it’s beyond worth it. A Decorative Souvenir. My husband and I took a trip to Europe this past summer and my biggest regret is that I didn’t splurge on a little something-something to bring home. You might think to yourself that you’re already spending money on the vacation and be concerned with how you’re going to get this said souvenir home (depending on how large it is), but I’m here to tell you to throw caution to the wind and just do it. Buy the expensive silk scarf to bring home and have framed. Buy the amazing Venetian hand-blown vase. Buy the unique African mask. Having those pieces in your home will make you SMILE, and that is what good design is all about. Antique Furniture. The easiest way to take your space from “yes, I’ve graduated from college within the past decade” to “heyyyyy, I’m adult and I have adult things” is to splurge on an antique piece of furniture. Now, don’t freak out, it doesn’t have to look like it came from your grandma’s house. Be on the hunt for something that’s Art Deco, Scandinavian Modern, Mid-Century Modern, Campaign style, even an old industrial piece. Whatever piece you buy will only continue to gain respect and add style to your home. A Dramatic Backsplash. A tile showroom might as well be a jewelry store for me. Checking out all the sparkling and shiny mosaics could keep be occupied for hours. There’s something to be said for splurging on a jaw dropping backsplash for your kitchen. Keep your cabinets simple and let the tile be the show piece. I’ve seen some amazing backsplashes that even incorporate my two favorite things: brass and marble. How can you beat that? If you’re into a little more color, try a bold encaustic cement tile to liven up the space.